Lawrence Bragg discovered how to ‘see’ the positions of atoms in solids. His discovery has had an enormous impact on chemistry, biology, and mineralogy. Bragg showed how X-rays passing through a crystal collect information allowing the crystal’s atomic structure to be deduced. X-ray data enables scientists to build 3D models of how atoms are arranged in solids. Bragg’s discovery was arguably the most significant experimental breakthrough in twentieth century science. He became the youngest ever winner of a scientific Nobel Prize for his work. Later, as director at the University of Cambridge’s Cavendish Laboratory, he launched a program of X-ray research into proteins that led to the discovery of DNA’s double-helix structure. William Lawrence Bragg was born on March 31, 1890 in Adelaide, capital of the British colony of South Australia. His father was William Henry Bragg, Professor of Mathematics and Physics at the University of Adelaide. His mother was Gwendoline Todd, an accomplished watercolor artist. Lawrence was the first of his parents’ three children. They enrolled him in a convent school at the age of five, and on schooldays he walk there and back from his home unaccompanied. In late 1895 Wilhelm Röntgen in Würzburg, Germany stumbled upon an incredible new phenomenon – X-rays. In January 1896 news of the discovery began spreading in the popular press. The ability of scientists to see through solid objects both thrilled and terrified readers. Soon after Röntgen’s announcement, six-year-old Lawrence had his very first encounter with the mysterious rays, the same rays that 19 years later would bring him the Nobel Prize in Physics. Lawrence’s father was fascinated by Röntgen’s work and built his own X-ray equipment; he used it to take Australia’s first X-ray photographs. Shortly after his father built the equipment, Lawrence broke his elbow falling from his tricycle. His father took an X-ray photograph of the broken elbow to help doctors treat his son. This was one of the first medical X-rays taken in Australia. After working for over 12 years at the University of Adelaide, Lawrence’s father was granted a year’s leave to return to his native England. He wanted to introduce his family there to his Australian wife and children and to discuss his work with old friends. Of course there were no flights in those days; a long sea journey was required. Lawrence traveled with his family around Britain, seeing the country and meeting relatives for the first time. Back in Adelaide, aged nine, Lawrence enrolled in Queens School. The school had a rigorous curriculum and Lawrence thrived academically, particularly in Mathematics, Physics, and Chemistry. In 1901, just before reaching his eleventh birthday, he started high school at St Peter’s College, Adelaide. The school followed a mainly classical curriculum of English, French, Latin, and Greek literature. Lawrence also studied Mathematics and Chemistry. Interestingly – given his future Nobel Prize – Physics was nonexistent at the school. Lawrence was so far ahead of other students, particularly in Mathematics and Chemistry, that he was quickly placed into senior classes. He completed high school aged 15. Early in 1906 he began studying Mathematics, Physics, and Chemistry at the University of Adelaide. He graduated at age 18 with a Bachelor’s degree in Mathematics with first-class honors. Despite his remarkable academic successes, high school and university were unhappy times for Lawrence Bragg. He was so much younger than his fellow students that he always felt like an outsider. For the rest of his life he would be a reserved, private man, often preferring his own company to that of others. In 1909, aged 19, Bragg began studying for a Mathematics degree at the University of Cambridge. In fact, his whole family had moved to England because his father had been appointed Cavendish Chair of Physics at the University of Leeds. Slowly Bragg began making friends at Cambridge: for the first time in his life he felt he was moving among kindred spirits. Heeding the advice of his father, he decided to major in Physics rather than Mathematics. In 1911, aged 21, Lawrence graduated with a first class honors degree in Physics. Upon completing his degree, Bragg became a graduate student in J. J. Thomson’s laboratory at Cambridge. 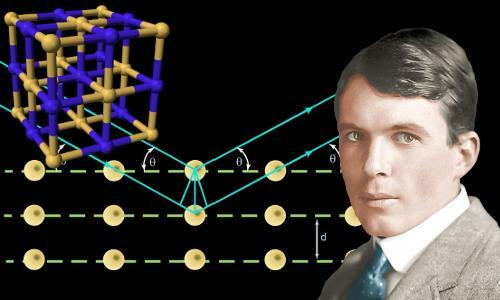 In 1912, aged just 22, he made a momentous discovery that became known as Bragg’s law of X-ray diffraction. Earlier in the same year Max von Laue in Munich had discovered that X-rays can be diffracted by crystals, and were therefore waves; he would receive the 1914 Nobel Prize in Physics for this discovery. Prior to Laue’s work, many scientists – including Lawrence Bragg’s father – believed X-rays were particles and could not be diffracted. Diffraction happens when a wave, such as an X-ray, meets an obstacle or gap. The wave bends around the corners of the obstacle or gap. Diffraction is particularly noticeable if the size of the obstacle and the wave’s wavelength are similar. In the case of Laue’s work, the atoms in the crystal had similar spacings to the wavelengths of the X-rays. If a wave meets obstacles whose spacing is similar to the wave’s wavelength, an interference pattern can be produced. Interference patterns contain areas where the diffracted waves have reinforced one another and others where they have canceled one another. Reinforcement is called constructive interference. Canceling is called destructive interference. A wave coming from the left has passed through the gaps at A and B. The two waves spreading from gaps A and B meet each other and produce an interference pattern with zones of constructive and destructive interference. In the image above, it would be possible to deduce the exact spacing between A and B by analyzing the interference pattern. Lawrence Bragg scrutinized Laue’s X-ray diffraction paper. Although still only a young graduate student, he drew the bold conclusion that Laue had misunderstood both the X-rays’ properties and the likely arrangement of atoms in crystals. Color enhanced X-ray diffraction photos from Lawrence Bragg’s 1912 paper in Proc. Camb Phil Soc. On the left is the interference pattern Laue obtained from X-rays diffracting through a crystal of zinc sulfide. On the right, is Lawrence Bragg’s analysis of the interference pattern. In a masterstroke that dramatically simplified analysis, Bragg realized that Laue’s diffraction photo was the interference pattern of reflections from flat sheets of atoms within the crystal. This revelation came to him as he walked alone one day along the banks of Cambridge’s River Cam. Waves reflecting from sheets of atoms at different depths in the crystal interfere with one another, leading to the diffraction pattern. Bragg diffraction. Two in-phase X-ray beams with wavelength λ are reflected from two different atoms in a crystal. 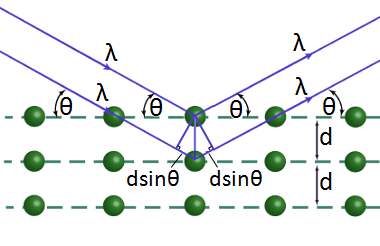 The lower beam covers an extra distance of 2dsinθ and will interfere with the upper beam, leading to an interference pattern. The dark spots on Laue’s photo show where constructive interference has taken place. Bragg deduced that this happens when the distance d equals an integer multiple n of the X-ray’s wavelength. Thus Bragg now had a method for finding d, the exact distance between atoms in crystals. Taking X-ray diffraction photos of a crystal from different positions would allow the full structure of the crystal to be found. This was one of the most crucial breakthroughs in the history of science. For the first time ever scientists could now potentially see what a substance looks like on the scale of its atoms, enabling them to build 3D models of the substance’s atomic structure. Bragg’s father was very impressed by his son’s work and began experiments in Leeds, which his son participated in, to make the first determinations of crystal structures. Even today, over a century after the Braggs’ pioneering work, X-ray crystallography, albeit with more sophisticated equipment and computational methods, is still by a huge margin the method of choice for determining the atomic structure of solid materials. The Braggs – father and son – shared the 1915 Nobel Prize in Physics for their work. Lawrence Bragg remains the youngest ever winner of a science prize – he received it aged 25 for work he carried out aged 22. Lawrence served in the British Army in World War 1, winning the Military Cross for gallantry. During the war he carried out field research to discover the location of enemy artillery by sound ranging. Lawrence’s younger brother Robert was killed at Gallipoli in 1915, shortly after the death of Henry Moseley in the same campaign. In 1938 Lawrence Bragg succeeded the recently deceased Ernest Rutherford to the Cavendish Chair of Physics at Cambridge. During Bragg’s early years in this role, World War 2 disrupted the normal work of the laboratory. In 1941 he became Sir Lawrence Bragg, knighted by King George VI. When the war ended Bragg made X-ray crystallography one of the Cavendish laboratory’s priorities, beginning a major study of protein structure in 1948. In 1954, aged 64, Bragg left Cambridge for London, where he became director of the Royal Institution and director of the Davy-Faraday Research Laboratory. He retired in 1966, aged 76. Lawrence Bragg’s scientific interests did not stop with physics. He had a lifelong passion for the natural world too. In his youth he collected seashells on South Australia’s beaches, building up a notable collection. At age 16, while studying mathematics at university, he continued shell collecting in his spare time, finding a cuttlefish bone he could not identify. This was unusual, so he took it to Dr. Joseph Verco, an expert on mollusk shells. It turned out Bragg had discovered a new species of cuttlefish. Verco named it Sepia braggi in honor of its young discoverer. In 1921, aged 31, he married 22-year-old Alice Hopkinson. The couple had four children – two boys and two girls. While working as a physics professor in London, Bragg secretly took part-time employment as a gardener because he enjoyed gardening so much. William Lawrence Bragg died aged 81 on July 1, 1970 in Ipswich, England. He was buried in the chapel of Trinity College, Cambridge. "Lawrence Bragg." Famous Scientists. famousscientists.org. 13 Jun. 2016. Web. Small black and white image of Lawrence Bragg used adjacent to quoted text courtesy of State Library of South Australia [B 4012].